Big Green SwitchBlogNewsHow do Solar Panels Work? We use electricity almost constantly throughout the day, which is why it is important for us to find renewable sources. Burning fossil fuels in order to produce electricity is an unsustainable and unproductive method; not to mention the many environmental issues that can be damaging to the entire planet when greenhouse gases are emitted. Solar panels are a great way to provide a constant, reliable stream of energy – the best thing about them? They’re free after they have been installed (and you can even make money from them!). But what exactly are they? Solar energy is the form of transforming the light energy given by the sun into electricity. Exploiting this free energy is a great alternative to fossil fuels because it is never ending – except for when the sun goes down. 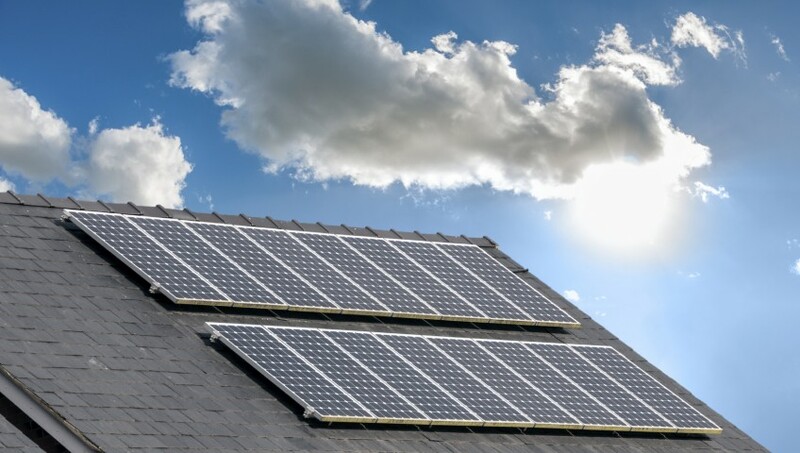 The sun transmits more energy to the Earth’s surface in one single hour than the world uses in an entire year, so taking advantage of it is a no-brainer for any homeowner! The electrons that move through a wire to light up a bulb is called the flow of electricity. This flow can be created through a solar cell – the small device which can convert sunlight into electric. They are made either from monocrystalline or polycrystalline silicon with a choice of black or blue surfaces. Because one single cell doesn’t have the capacity to power an entire home, they are connected together in a frame to make a module. Modules are then connected together to create a solar array – the solar ‘panel’ that you see on rooves of homes and buildings. Once the light given from the sun hits a solar cell, it is converted into direct current (DC) energy. This DC energy is then converted into alternating current (AC) through a small electrical device called a converter. The reason for this is because AC energy is the same electricity supplied through an energy company to power electrical items in your home. There’s no need to be living in a hot environment that has the privilege of seeing the sun for 15 hours a day; solar cells need light and not heat, which is why they’re excellent for using in UK homes. Can I produce too much electricity? Whilst it is true that the more sunlight a solar panel receives the more energy is created, it’s not necessarily a negative thing! If the solar panels on the roof of your home are receiving too much direct sunlight it doesn’t need to be wasted. You can actually make an extra bit of cash if you opt to export this extra energy back into the mains National Grid, where it would essentially be ‘bought’ off you and get redistributed to buildings all over the country. Get in touch with one of the team today and let us help you make the Big Green Switch to an eco-friendly, energy efficient home. You’ll be able to recognise the cost benefits whilst you get peace of mind knowing that the entire thing is environmentally-friendly. It’s a win-win situation for everybody!